Riot Games has paid homage to one of the game’s greatest players with a voiceline for an upcoming skin. Lee “Faker” Sang-hyeok will probably always be regarded as the greatest League of Legends player of all time. After coming to prominence as a part of SK Telecom T1 K in 2013, one of his greatest moments was in the finals of OGN Champions of that year, where he outplayed KT Bullets’ mid laner Ryu Sang-wook in a Zed mirror match, resulting in Erik “DoA” Lonnquist’s legendary call of the duel. Zed’s latest skin, Galaxy Slayer Zed, features a whole new set of voicelines—and one of them comes from killing another Zed. “Look at the skills, look at the moves, Zed, what was that?” It’s an obvious reference to the brief display of brilliance that has been immortalized in esports history. Faker is no stranger to recognition from the game’s creators, though. For example, he was in the “RISE” music video for Worlds 2018, and Riot gifted him a figurine of his character from the video. This continues Riot’s trend of attempting to bring together the world of esports with its general gaming community to ensure that newer players have the opportunity to learn about historic plays from the small acknowledgements added to the game. The legendary skin itself is a work of art, with a new model and textures as well as new audio and visual effects allowing players to really sink their teeth into this take on League’s most traditional ninja assassin. 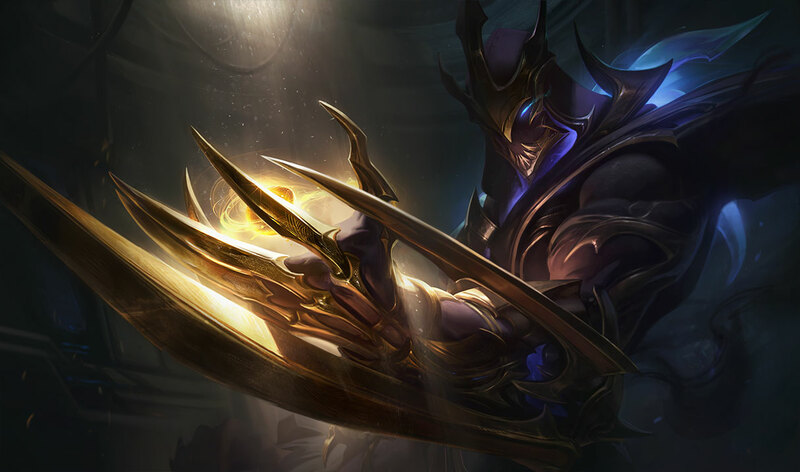 Zed mains and regular players alike should be able to get a hold of the skin when patch 9.8 releases in just under two weeks—it will likely cost 1,820 RP. Galaxy Slayer Zed also fits into the Odyssey universe introduced last year since he was formerly a part of the Templar order that Sona belongs to before becoming disillusioned with their teachings. His special interactions, for the most part, insult various champions from the Morning Star crew and insinuate that he should be the most powerful being in the universe. The Odyssey event debuted last year to much acclaim from the community. But does the release of a new related skin on the PBE hint that the event may be returning this year? We’ll just have to keep our eyes out for any trace of our favorite rag-tag group of space adventurers flying by soon.